Seeing bag after bag of “cat food” in shops and at vet clinics can be a confusing thing. 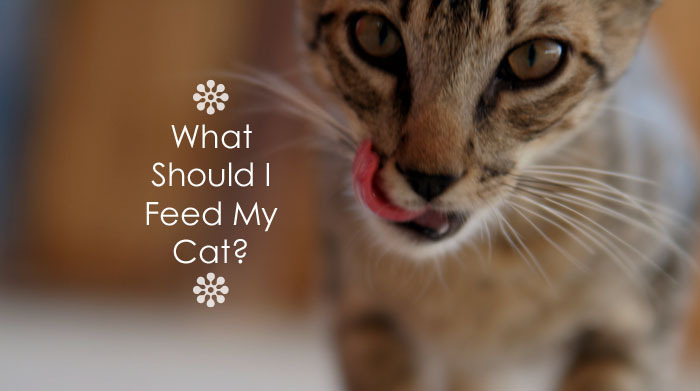 All or most say that they provide complete nutrition for your cat. Let’s take a moment, get past what food companies are telling us, and look at what our cats need to be eating. Cats must eat meat to survive. Domestic cats must eat meat protein. This is a result of their ancestral genetics. Why meat? Simply put, their bodies cannot do the nutritional “conversion” of vitamins and minerals obtained from plant based foods. They must rely on another animal to process the nutritional substances first, then receive the nutrition, via the prey’s flesh, which can then be absorbed by their feline digestive system. What about commercial cat food? It must be formulated to give cats what they need, in the best way possible, yes? As we have mentioned in the post about what’s wrong with pet food, commercial pet foods are not necessarily designed to give your cat what’s best, via the best means possible. The animals used as meat protein in commercial food are themselves in very poor health and offer little in the way of nutrition. They are often fed cheap corn, which is designed to grow a larger feed-animal, not raise nutritious food. Additionally, the moisture content in processed meat protein is much too low, causing stress of a cat’s kidneys and liver. Meat from (formerly) live prey contains up to 70% water. Cats are not built to handle and process carbs. They lack the enzymes needed to break down and digest carbohydrates in anything but small quantities. As with other substances including Vitamin A, Niacin and Taurine, carbs can only be used in a pre-digested form. The digestive system of a cat operates in “speed mode.” It requires moist, energy-rich proteins which carry the other necessary pre-digested nutrients which are ready for feline digestive system absorption. Meat is the answer. High quality, raw meat pet food products from your local organic supplier is best. Commercially processed “meat-based” products just don’t provide the nutrients kitty needs. Fibre is also a valuable component of a cat’s diet. It aids in digestion, improves nutrient absorption and prevents constipation, among many of the other benefits we discussed in this post. At BiologicVET, we use a blend of organic defatted flax, sunflower and sesame seed fibre as a delivery system for nutrients. Living in a world of imperfect food choices, adding BiologicVET pet nutritional supplements to your cat’s raw meat, or even dry food, will provide her with a yummy and complete nutritional package. They provide the proper balance of active vitamins, minerals, enzymes, trace minerals, prebiotics, lignans, protein, amino acids and antioxidants they need to sustain healthy digestion, immune and cellular function, tissue, muscle and bone maintenance, skin, coat and general health.